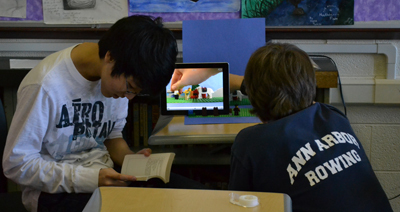 Don Packard’s freshman English class uses iPads and Legos to re-create scenes from Shakespeare’s Romeo and Juliet. View Lego-mation scenes below. If you looked closer, you would have noticed many of them holding iPads, taking pictures, or closely studying their paperback copies of Romeo and Juliet. 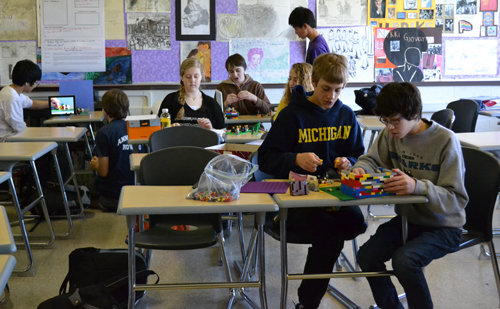 The Pioneer class was tasked with a Lego-mation version of Romeo and Juliet’s drama. The project engrossed students in the traditional Shakespeare text and in non-traditional technologies. Students used iPads, MacBooks or even their own iPods to take the photos, create an audio track, and mesh the two together. They had to rely on a deep understanding of the text – and healthy imaginations. “It’s sort of tricky because they don’t really make Lego people with sad expressions,” said Kara Monchamp, who was tasked with reenacting the final scene. Lego Friar Lawrence, who just discovered a dead Romeo, had his hands in the air. Students had the option of recording the script in the traditional language or in modern English. Given the severity of the final scene, Kara opted for the original verse. “Their responsibility is make the characters still come through as intended,” Packard said. Packard planned to have a class viewing of all the scenes in order. Each group will present their Lego-mation piece and explain their creative process. Packard brought in some Legos, and the students helped out by bringing their own from home. Backdrops were made of Lego blocks, construction paper or cardboard boxes. The MacBooks were from the school’s laptop cart, and the iPads came from a grant given to Packard by the Class of 1962. The Lego-mation project tops off a Romeo and Juliet unit in which students read the play, watched film adaptations and had plenty of class discussion. The students seemed pleased to have a creative outlet for their intimate understanding of the play. One pair made a despondent Lego Romeo exit the scene on a zip line. Another group worked on translating Shakespeare’s script to modern-day English. Yet another group tried to show Juliet pleading–although Legos can’t kneel– not to be forced to marry Paris. I recently like the very helpful details people give to your content regularly. I most certainly will save your web site and look once more the following often. Now i am fairly i will be educated a lot of brand-new things proper the following! Have fun for!